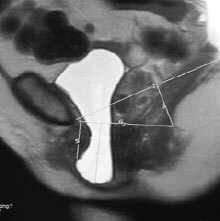 The UCLA Urology and Radiology Departments developed an imaging technique that correctly and consistently identifies complex forms of pelvic organ prolapse. The imaging test requires no patient preparation and is ideal for the objective evaluation and follow-up of patients with pelvic prolapse and pelvic floor relaxation. 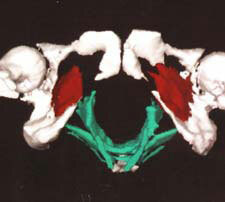 MRI has become the study of choice at our institution for evaluating the female pelvis. Due to the large volume of patients presenting to UCLA with mesh-related vaginal surgery complications, the UCLA Urology and Radiology Departments have collaborated to develop an ultrasound technique to correctly identify previously placed mesh. This helps surgeons in the pre-operative planning for the patients, as mesh is not visible on standard X-ray, CT, or MRI imaging. This technique has helped us tremendously in the treatment of our patients.